Who invented the Segway? The name of the person credited with inventing the Segway is Dean Kamen (1951 - Present). Dean Kamen is not only famous as the American inventor of the Segway but also as a businessman, entrepreneur and engineer who has nearly 500 other inventions and patents to his credit. When was the Segway invented? Dean Kamen invented the Segway in 2001, during the Technology and Information Age of inventions. Definition of the Segway: The Segway is defined as a self-balancing, two wheel small footprint electric vehicle used as a personal transportation device, controlled by moving body weight and operated in any level pedestrian environment. Fact 1: Who invented the Segway? The Segway, best described as a stand-up scooter, was invented by Dean Kamen in 2001 during the Technology and Information Age of inventions. Fact 2: Who invented the Segway? Prior to the invention of the Segway in 2001, the pedal bicycle was invented by Kirkpatrick Macmillan in 1839. Fact 4: Who invented the Segway? The Segway inventor, Dean Kamen, was born on April 5, 1951 in Long Island, New York, United States. 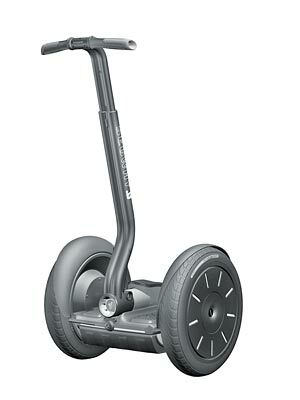 Fact 5: Who invented the Segway? The early years of Dean Kamen were spent in Long Island, New York, United States where he was raised by his family. His father Jack Kamen, was an illustrator for publications such as Weird Science and Mad. His mother Evelyn Kamen, was a teacher. Fact 6: Who invented the Segway? Dean Kamen was always interested in new ideas and inventions. By the time he was at High school he had began to make money by designing and installing light and sound systems. Fact 7: Who invented the Segway? Dean Kamen graduated from High School, by which time his was earning more money from his inventions than both of his parent wages put together. He went on to attend Worcester Polytechnic Institute (WPI) in Massachusetts. Fact 8: Who invented the Segway? As a student at WPI Dean Kamen continued with his inventions and nurtured his passion for technology and went on to invent. the first wearable infusion pump, a medical device used to deliver drugs or fluids into a patient’s body in a controlled manner. His wearable drug infusion pump rapidly gained acceptance with various medical bodies and was used in chemotherapy ttreatments for cancer patients. Fact 9: Who invented the Segway? Dean Kamen dropped out of Worcester Polytechnic Institute, eager to pursue a career in developing and creating new inventions. Fact 10: Who invented the Segway? In 1976, Dean Kamen founded his first medical device company, called AutoSyringe, Inc., to manufacture and market the pumps. Fact 11: Who invented the Segway? AutoSyringe, Inc. became incredibly successful and Dean Kamen had invented other medical pumps and devices such as the first wearable insulin pump for diabetics. Fact 12: Who invented the Segway? In 1982, at the age of 30, Dean Kamen sold AutoSyringe, Inc. to another health company, Baxter International, in a deal that made Dean Kamen a multimillionaire. Fact 13: Who invented the Segway? Dean Kamen then founded a new company called DEKA Research & Development, a play on his name "DEan KAmen" and went on to invent numerous other inventions that advanced medical care. Fact 14: Who invented the Segway? He went on to establish an organization dedicated to motivating kids to understand, use, and enjoy science and technology. He called the organisation FIRST (For Inspiration and Recognition of Science and Technology). In 2000 Dean Kamen awarded the National Medal of Technology by President Bill Clinton. Fact 15: Who invented the Segway? The invention of the Segway began much earlier when in 1992 Dean Kamen had began to develop the iBOT, a powered wheelchair. The iBOT resembled a traditional power wheelchair, but was narrower, more compact and had the unique ability to balance on two-wheels. The iBot was controlled by a sophisticated array of gyroscopes, electric motors, and computers. Fact 16: Who invented the Segway? The iBot powered wheelchair could be used over over rough terrain was even able to climb stairs. The mobility of the iBot stair-climbing wheelchair was so amazing that its was nicknamed 'Fred' after the great dancer Fred Astaire. The iBot wowed the world and inspired Dean Kamen to invent another powered vehicle that would eventually be called the Segway. Fact 17: Who invented the Segway? The invention of the Segway used Dean Kamen's unique balancing technology of the iBOT wheelchair. The Segway super scooter no brakes, no engine (battery-powered), and no steering wheel. Fact 18: Who invented the Segway? During its development the Segway was nicknamed 'Ginger' after Fred Astaire's famous dancing partner Ginger Rogers. News of the development of the super scooter was leaked and led to a huge amount of speculation before the vehicle was launched. Fact 19: Who invented the Segway? 'Ginger' was eventually revealed on December 3, 2001 as the Segway. The small footprint electrical vehicle used a process called dynamic stabilization, that worked with human equilibrium and responding to the movement of the person. Fact 20: Who invented the Segway? The Segway accelerated as the person leaned forward and stopped when the person tilted backwards or stepped off. The mobility of the Segway was such that it was able to perform full turns steered by handlebars. Fact 21: Who invented the Segway? The Segway weighed 80 pounds and achieve speeds of up to 12.5 mph, and was able to get up to 17 miles out of a single charge. Fact 22: Who invented the Segway? The Segway did not quite live up to the original hype and various problems with the design have been addressed over the years. It is still expensive but has been put to successful use by emergency medical services and special police forces.